The first speech and debate competition was November 3rd and it kicked off the season! Speech and debate has officially started their 2018-2019 season. Their first debate was on November 3rd and took place at Sprague High School in Salem. This year, Senior Emily Basler and Junior Mercedes Ferris are the captains and Ms. Gerst is the coach. Practices for the speech and debate team are held on Tuesdays and Thursdays in S235 right after school from 3:30 to 5:00pm. Ms. Gerst, captain Emily Basler, and co-captain Mercedes Ferris shared some information about the first speech and debate competition. The team did not get a trophy or certificate at their first competition but they still had a good time and a good first competition. 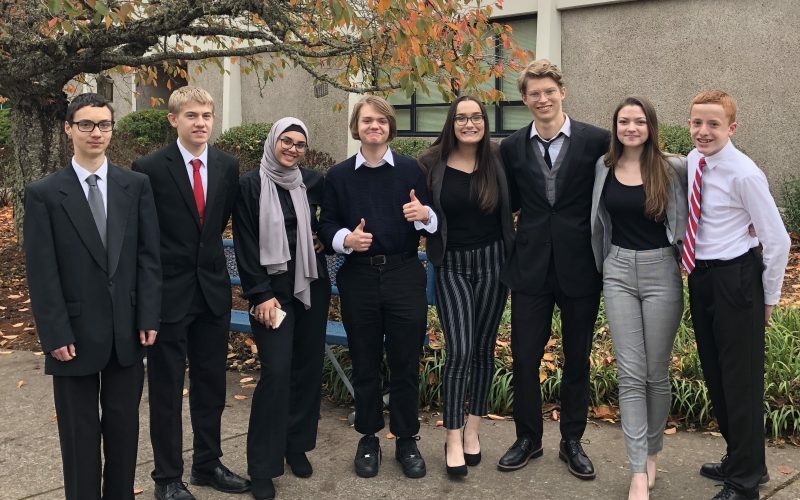 “It went great, we didn’t win anything, but we went to Sprague High School in Salem… We went down on a bus and we traveled with Glencoe High School and we competed in debate… and we didn’t win any certificates or trophies but we still had fun,” stated Ms. Gerst. Emily Basler also said that she really enjoyed judging the competitions as well and that being able to judge is something that she doesn’t get to do very often. The co-captain of the team, Junior Mercedes Ferris, competed in the tournament and she also shared some of her experience. Mercedes also shared information about what the debate topics usually include. They usually have topics that are about society and politics. For individual events the students practice and work on their speeches to perfect any minor mistakes so that they can be prepared for the competitions. In competitions, they have to give their speeches three or four times in a tournament in order to advance to as far as possible. Debates are run a little bit differently, the students go round by round, just like individual events but there are wins and losses for each round, and your wins and losses determine if you advance or not. Also, for each round of you get different topics that you debate with another team about. “With debate it’s just a win or loss, you either win the round or you lose the round and depending on how many wins and losses you have, you go to quarter finals, semi-finals, and finals.” Ms. Gerst said. The team has been doing a lot of fundraising as well, and have many new members. They continue to bond and build camaraderie through doing those fundraising events. Emily Balser expressed her excitement for this new competition season. The team will be heading to more competitions in the winter. The speech and debate team seems to be looking forward to the season that just kicked off! We wish them good luck and we can not wait to see what they will accomplish this season!